The Philip & Patricia Marco Collection: Notable Works of American Indian Art on Auction, February 10 | Skinner Inc.
BOSTON, MA – Skinner, Inc. presents The Philip & Patricia Marco Collection, featuring American Indian art. The 132 lots being offered on February 10 in Boston were acquired primarily in the 1980s when the selection was broad. In addition to its high quality, the material in the auction has the attraction of being fresh to the market. Philip and Patricia Marco formed a film production company in the 1970s which would eventually become one of the premier television production companies in the United States, producing hundreds of award-winning projects. Phil, who studied fine art at Pratt Institute and the Art Students League, has been the recipient of virtually every major award for excellence in print and cinematography, including the Grammy, Clios, and Cannes Lions. Phil Marco has created many memorable images for print, television, and cinema for clients throughout the world. His work is represented at New York’s Museum of Modern Art, as well as the Museum of Broadcasting Arts and the George Eastman Museum of Photography His signature as photographer and filmmaker is graphic simplicity, and that appreciation informs his enduring interests as a collector. Great collections can start in many ways. The Philip and Patricia Marco collection began with a phone call. One day in the mid-1980s, Pat took a break from her duties as partner and executive producer of the award-winning Marco film production company to visit the Native American Art show at the Armory in Manhattan. She was stunned by the scope of the creativity artfully expressed with so many varied materials and colors. Eager to share this experience with Phil, she called him to meet her at the Armory and see for himself what had excited her so. When they met, as she had predicted, Phil was deeply moved by the strength and purpose of these amazing, beautifully crafted objects. That evening Pat and Phil each purchased a piece, the beginning of a 35-year love affair with Native American peoples, their art, and their traditions. 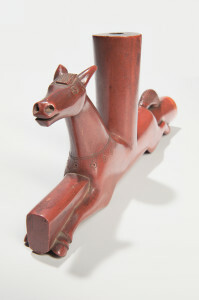 While the Marcos focused on Plains and Woodland Indian material, there are also some select Northwest items, which are in short supply and seeing high demand at present. The strong sculptural appeal of this collecting niche is evident in a large Northwest Coast sheep horn ladle, c. last quarter 19th century (Lot 18, Estimated between $4,000-6,000). 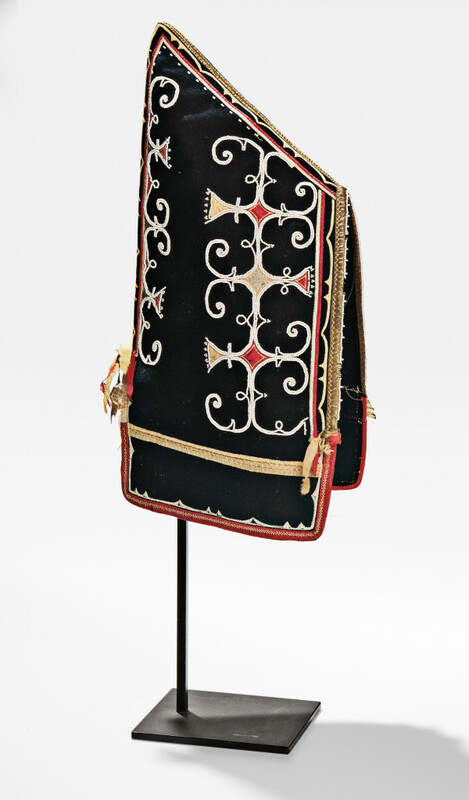 A Huron quilled hide pouch, c. last quarter 18th century (Lot 124, $15,000-20,000) is especially noteworthy. Douglas Deihl, Director of American Indian & Ethnographic Art, points out that it is very early as well as exquisite and that the quillwork is exceptional and in great condition for its age. The handwritten tag that reads “POUCH, North America” tells its own story. Deihl notes that such a tag is usually an indicator of European ownership at some point. In the 19th century, a great deal of American Indian material was collected by Englishmen who had come to Canada and the United States on military duty or in pursuit of business opportunities. ♦ Great Lakes pipe bowl (Lot 80, $2,000-2,500) Another fine example of the form, this early pipe bowl is very elaborate and finely carved. It is distinguished for its inlays of lead and various stones. ♦ Great Lakes bird effigy rattle (Lot 114, $6,000-8,000) is a Deihl favorite for its sculptural presence and kinetic quality. ♦ Micmac beaded and silk appliqué decorated woman’s hood, c. 1840s (Lot 132, $20,000-30,000). This example of a classic design featured in several museum collections is notable for its early date, fine stitching and overall excellent workmanship. 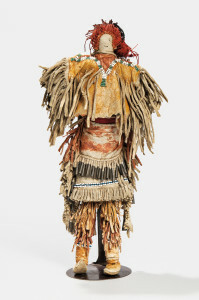 Among numerous other notable items in this carefully curated collection are a beautifully detailed Apache hide doll (Lot 59, $5,000-7,000), a Sioux painted buffalo hide dance shield (Lot 63, $12,000-16,000) with haunting single animal image and well-preserved color, and a very large and elaborate Lakota beaded and painted wood pipe tamper (Lot 65, $3,000-4,000). A collection reflects the values and tastes of the collectors. The Marcos’ careers in the supremely visual medium of film have been guided by enduring principles of graphic design. The Native American works they amassed reflect the same appreciation of the timeless appeal of minimalism and forthright simplicity of form. Auction previews are free and open to the public. They will be held in Skinner’s Boston gallery, 63 Park Plaza, on Wednesday, February 8, 12PM-5PM; Thursday, February 9, 12PM-7PM; Friday, February 10, 8AM-9:30AM. The print catalog is available for purchase from the Subscriptions Department at subscriptions@skinnerinc.com. Prices realized will be available at www.skinnerinc.com during and after the sale. The Skinner website enables users to view all lots in the auction, leave bids, and bid live, in real-time through SkinnerLive! This entry was posted in News and tagged American Indian, American Indian Art, Apache, boston, effigy rattle, ethnographic art, Great Lakes, Huron quilled, Lakota, Micmac, native american, Native American art, Pat Marco, Patricia Marco, Phil Marco, Philip & Patricia Marco, Philip Marco, pipe bowl, Plains Indian, Sioux, skinner, skinner auctions, Woodlands Indian by Skinner. Bookmark the permalink.